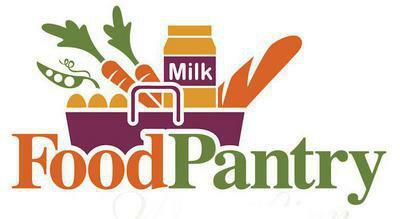 Italy Food Pantry will be open on Monday, October 16, 5-7 pm. It is always open the THIRD MONDAY of each month,including holidays. If your family, or a family you know, is struggling and needs food assistance, please come to the Italy Food Pantry, 504 W. Moseley (next to Mama’s Mexican Restaurant). There is minimum paperwork, but you will need to bring proof of residence in Italy, Forreston, Avalon or Milford. 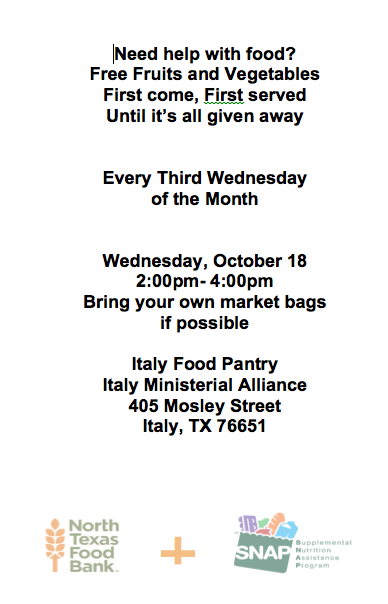 The North Texas Produce Truck will be in Italy on Wednesday, October 18, 2-4 pm. It will be here the THIRD WEDNESDAY of each month. The NTFB will provide a bag of fresh vegetables and fresh fruits for anyone who will come by the Italy Food Pantry to pick it up! Again, minimum paperwork is necessary for the NTFB’s records, but—if you could use fruits and vegetables, please come by!